I lived in Moscow through the summer and fall of 1991, the last months of the Soviet Union, when food could only be reliably found in open-air farmers’ markets, at prices jacked up to market levels. During these days, I spent many hours with my friend Sergei Maslov who, like me, was studying at the Moscow Energy Institute. Often I would visit his family in their cozy apartment in the southeast corner of the city, and his mother Marina would make dinners for us. One of my favorite dishes was her authentic Ukrainian borshch. 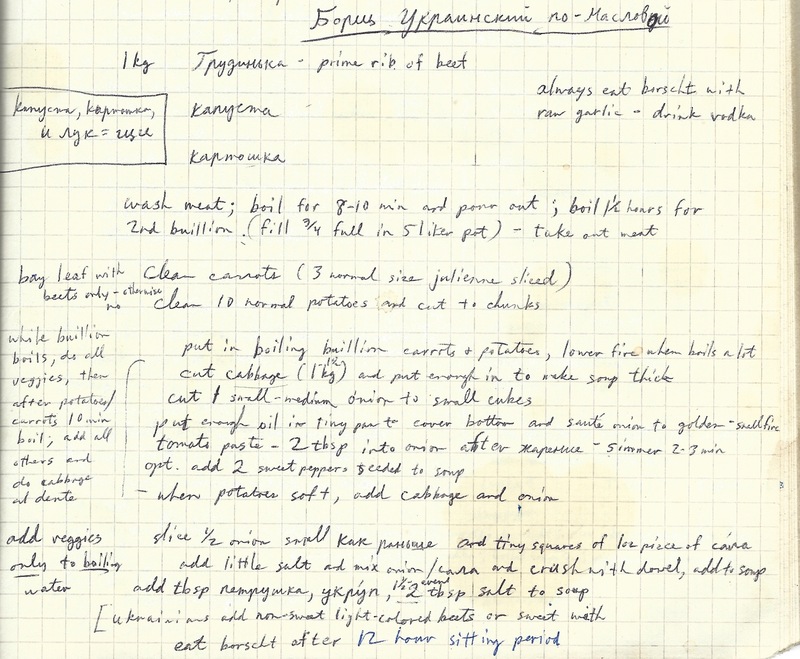 One day I took out my notebook and wrote down the recipe as Marina prepared the soup. I have scanned the original handwritten page and included it below. There was the private borshch, such as Mom’s frugal vegetarian version, endearing in its monotony. There was the vile institutional soup of canteens, afloat with reddish circles of fat. In winter we warmed our bones with limp, hot borshch, the culinary equivalent of tired February snow. In summer we chilled out with svekolnik, the cold, thin borshch popularized here in America by Eastern European Jews. Parallel to all these but ever out of reach was another soup: the mythical “real” Ukrainian borshch we knew from descriptions in State-approved recipe booklets authored by hack “gastronomic historians.” Apparently that borshch was everything ours wasn’t. Thick enough to stand a spoon in, concocted in myriad regional permutations, and brimming with all manner of meats. My original handwritten recipe. Click to enlarge. Marina Maslova’s recipe, which I reproduce here, is that “mythical ‘real’ Ukrainian borshch,” which will always hold a special place in my heart. Although most Americans think of borshch as beet soup, Marina told me that many Ukrainians don’t use beets. So you may choose to use them or not, as you prefer. In addition, the Maslovs always served their borshch with raw garlic cloves on the side; each spoonful of soup was followed with a small bite of garlic. Perhaps Marina was aware that garlic is a potent natural antibiotic, and eating raw garlic is an excellent way of warding off illness. Using a large (8 quart) stock pot, place the meat in boiling water and cook for 8-10 minutes, then pour off the water. This initial step helps ensure a clearer broth. Then refill the pot to ½ or more to cover the meat, and simmer for 1 hour or more. While it cooks, prepare the vegetables. Remove the meat from the pot and set aside. Place carrots, potatoes, beets, and bay leaf into the broth. Raise the heat to bring to a low boil, and cook for 10 minutes. While vegetables are cooking, place onion in a small pan with oil and sauté until tender and golden, about 10 minutes. Then stir in tomato paste and cook for another 2-3 minutes. This soup tastes wonderful when freshly made. But ideally, allow it to stand for 8-12 hours to allow flavors to combine before reheating and serving. Serve with a dollop of thick sour cream in each bowl. This entry was posted in Main Courses, Meals Remembered, Soups and Stews and tagged Beets, Russian, Ukrainian by Baron. Bookmark the permalink. 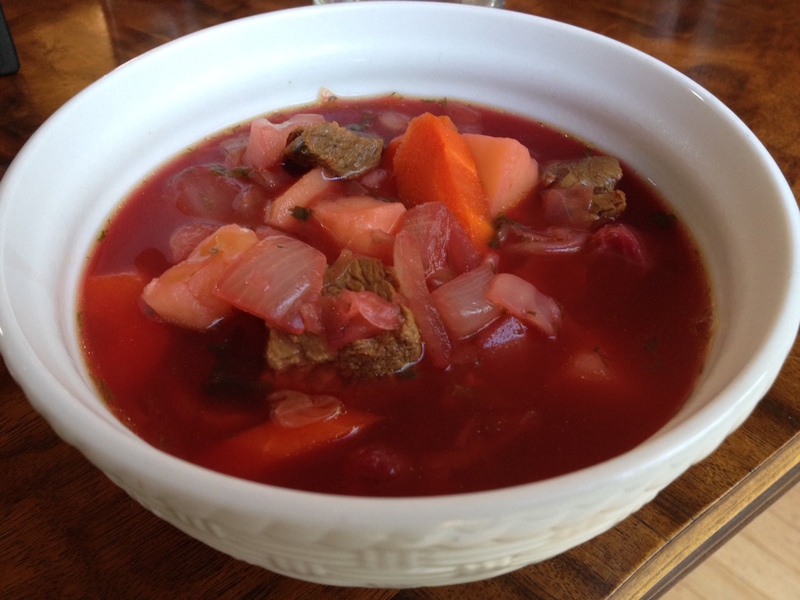 “Eat borscht with raw garlic – drink vodka.” This is wonderful!! You know it! Does it make you miss Russia?